Until a credit card error combined with an email filing error caused me to miss several issues in a row (and I was already months behind on actually reading them even then), I collected Buffy and Angel comics set after those shows had ended. 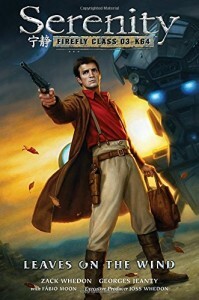 In addition to those, a handful of Firefly comics were released, but these were not of the full-sized sequel variety the others had been. A three issue follow-up story with only one spoiler of any consequence, and a second batch about which I, perhaps tragically, remember nothing (but it was past stories instead of future), and then by the time the third set happened, I had already had the card failure of which I speak, I guess? Leaves on the Wind is not only the fourth collection; it is also, finally, a full-fledged continuation of the story with (I believe) more to come. In addition to the fruits of that spoiler I mentioned, mostly this one is about the fallout of the big revelations broadcast by Malcolm Reynolds about the Reavers and how they relate to the Alliance; you know, the ground covered in the movie. There are people who don’t believe a word of it, people ready to start a whole new revolution, people looking for all kinds of bloody revenge. You know, the usual. Definitely worth reading, but read Those Left Behind first. This entry was posted in Words and tagged graphic novel, science fiction on March 29, 2016 by Chris. So, the one good thing about a new Star Wars timeline is I’m only one book behind now, right? Haha nope, there are already like six books, plus seasons upon seasons of animated television I never got around to watching. Oops. Then, blah blah speeder chases and dog fights and laser battles, you know how this stuff goes. 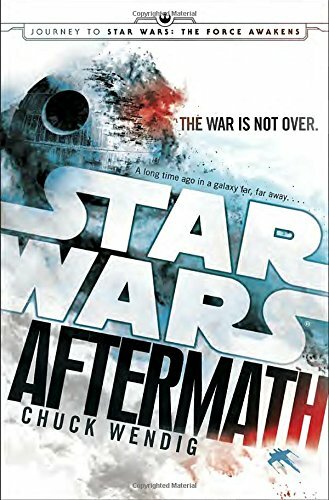 What made the book interesting (besides that it kicked off a new continuity, I mean) was all the vignettes about the state of the galaxy scattered throughout the book, none of which were in any way related to the main plot. I don’t mean to imply that the 50 some odd books I’ve read in what I think they’re now calling Star Wars Legends did not end up making it feel like a lived in galaxy, with trillions of sentient beings going about their lives. But something about the concerted effort Wendig put into making his new continuity feel immediately as lived in was very successful. Not to mention appreciated. Ultimately, I don’t think anyone is going to get anything deep and meaningful out of these books, but it was good enough that I’ll keep looking for them. This entry was posted in Words and tagged fantasy, Star Wars on March 21, 2016 by Chris. Friday was movie day, as occasionally comes around. And unexpectedly, 10 Cloverfield Lane was the new movie of the weekend. I’d been interested in this since I heard about it, and the lone preview I’ve seen helped that interest along, so. Short answer: I liked it. 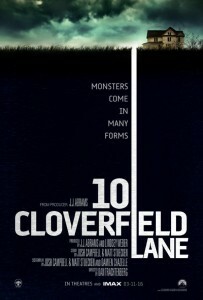 But, here’s the problem with naming your movie after Cloverfield: if the new movie is a direct sequel or shared universe sequel or prequel of the original, then the tension of the unknown is greatly reduced by this knowledge. Yet, by contrast, if the new movie is not directly related in some way to the original, then you’ve squandered this reduction in tension for no apparent reason. Or, even worse, tried to trick people into thinking they should be worried about the tension of the unknown when they shouldn’t be. No matter which thing is going on, my real point is this: if your audience is sitting there thinking about relationships to other movies and whether they make sense or even exist instead of fully paying attention to the movie you made, probably the title should be different. In a valiant attempt to avoid spoilers, I’m not saying which of those possibilities occurred, but I’m definitely saying I was thinking about this more than I would have liked. Especially because, late act revelations that the movies are linked or not, this one easily had the legs to stand on its own. The first 5-10 minutes in a nutshell: The second most successful alumnus of the old NBC soap opera Passions wakes up to find herself chained up in a fallout bunker by creepy John Goodman, but the good news is that “chained up in a fallout bunker by creepy John Goodman” is currently the safest place she could possibly be, because the world is ending. Just ask creepy John Goodman! Who wouldn’t want to watch that movie, I ask you? I’ll tell you a movie you probably haven’t seen that this was a spiritual successor to: After.Life. Man, I should watch that again. For at least two three reasons. Really, after any previous movie whose tension relied in part on the unknown; this point is broadly applicable. Or else if you did it on purpose to get people into seats and that’s the only reason, you are a bad person who should feel bad. This entry was posted in Film and tagged drama, science fiction on March 15, 2016 by Chris.